Nigeria's military says it has released 244 "repentant" Boko Haram suspects who have undergone rehabilitation. The authorities say they have been de-radicalised and can re-enter society, but critics are sceptical about whether they have repented. The group, which includes women and children, has been handed over to the governor of Borno state, an area badly affected by Islamist violence. The army released the suspects as part of activities marking Armed Forces Remembrance Day. Maj Gen Nicholas Rogers told local media the group was ready to re-enter society. "The detainees have been de-radicalised for reintegration into the society. We are handing over the detainees to Borno Government for administration", he said. There have been mass releases of Boko Haram suspects in the past, but this is the largest following a de-radicalisation programme. It coincides with a new video released by Boko Haram in which its leader, Abubakar Shekau, appeared with some of the remaining Chibok schoolgirls who have been held captive since 2014. More than 270 girls were kidnapped by the group from a school in the north-eastern town of Chibok. 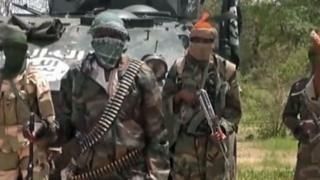 Boko Haram has been fighting a long insurgency in its quest for an Islamic state in northern Nigeria. The conflict is estimated to have killed tens of thousands of people. The Chibok girls represent a fraction of the women captured by the militant group, which has kidnapped thousands during its violent insurgency in northern Nigeria. Official Arabic name, Jama'atu Ahlis Sunna Lidda'awati wal-Jihad, means "People Committed to the Propagation of the Prophet's Teachings and Jihad"